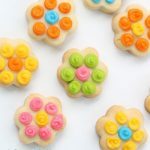 I know I’ve been bombarding you with flowers lately, but these flower cookie bites are perfect for Spring and Mother’s Day! This is the last one, though (maybe). I thought I’d share what I sent my own mom for the big day. Sorry for the lack o’ photos… I focused too much on the decorating and packaging! 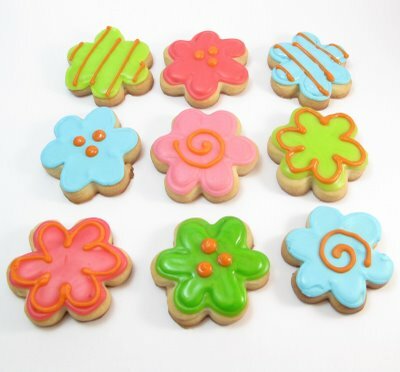 Cut out mini flowers with cutter and bake cookies according to recipe. Let cool completely. Mix frosting color(s) of your choice. 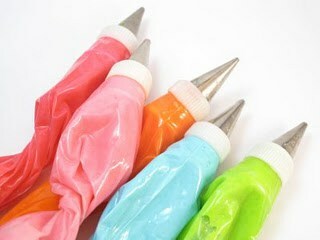 Prepare a bag of frosting with a size “4” tip and fill with half of one of the colors of frosting. Outline flower and let set well, about 15 minutes. With the other half of the same color, thin with water until the consistency of glue. 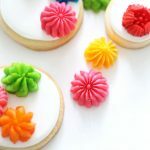 With a small spoon or squeeze bottle, pour thinned frosting in center of piped flower and let run to edges. You may help the frosting along with a small butter knife or spatula. . Let set well, at least an hour. 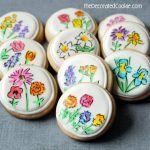 With a bag of frosting fitted with a “3” tip, pipe your designs on top of the set flooded cookie: swirls, stripes, dots, etc. Place cookies in cello favor bags (I did 3 per bag) and tie closed with thin ribbon. This is important, as the cello prevents grease from the cookies ruining the tissue paper. Package in tin with tissue paper. Cut a piece of thick grosgrain long enough to wrap around tin. Wrap around tin so ends are beneath tin and secure with double sided tape. Repeat with another piece of ribbon perpendicular to the first piece, but don’t secure with tape yet. Center piece of grosgrain you reserved in step two on tin. 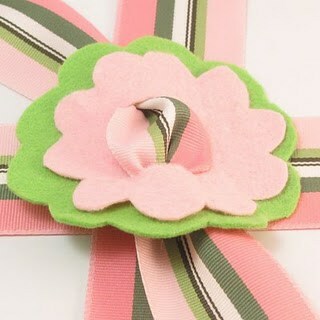 With safety pin, attach flower from underside to center of grosgrain. Secure grosgrain to tin with double sided tape. oh my, it’s so pretty! I’m sure your mom will love it! I’m all about the packaging too! 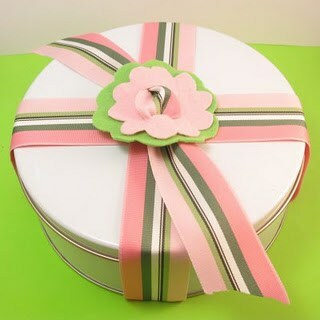 I have purchased tons of little boxes and ribbons and scrapbooking supplies just to package my baked goods. 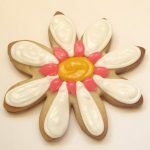 When I send my kid to school with some cookies for her teacher, it’s all gussied up! I think it makes it more special. They are so lovely and colourful! I bought your book a few months ago and it has been great ~ so many ideas! I had no idea that you had a blog until I came across a comment you left on bake at 350. I am so glad I found it! These are so pretty! I’m really enjoying the color choices, and how nice and neatly you explain how to make everything! Don’t you find it takes so long to remember all those steps and do your project too?! Great job!! Wow, these look fantastic! Thanks for the detailed tips. Oh, and you can never have too many flowers. cakebrain–thanks! after working in a store so long where packaging was half the battle, I’m sorta obsessed. Great feedback cookies and cups! And to know where you found me. thanks Marian and Cafe Chick! And love all your web sites, too. i love the box gift. so cute. These are gorgeous! I’ve pinned them for inspiration when the family comes over for Easter.